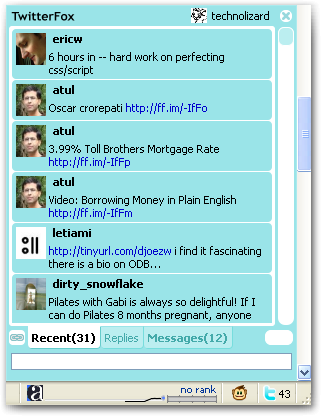 TwitterFox is a Firefox extension that notifies you of your friends’ status on Twitter. TwitterFox adds a tiny icon on the status bar that notifies you when your friends update their status. You can also update your tweets using the text input field. After installing TwitterFox, a gray TwitterFox icon will appear on the status bar. Click on this icon to open setup preference panel. A pop up window will open. Now click on Add account button and add your user name and password. Click on OK button to login to Twitter. Now whenever your friends will update their tweets, TwitterFox will pop up a small balloon on right bottom corner on your browser window. If you click an icon of your friend, TwitterFox will open the friend’s page in a new tab. If you already opened the page in the other tab, TwitterFox switches to the tab. You can see the last 40 updates by clicking on the TwitterFox icon on the status bar. You can also reply to your friends using this window. TAB – Change TwitterFox’s tab. Ctrl+Shift+L (for Mac: Command+Shift+L) – Insert current tab’s URL into the input message box. 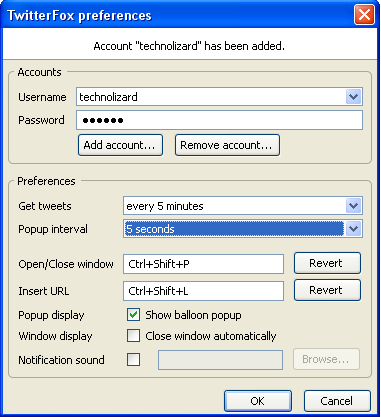 Ctrl+Shift+P (for Mac: Command+Shift+P) – Open/close TwitterFox window.